This post is sponsored by my friends at Michael’s. January for most of us represents a new start. When it comes to physical goals, spiritual goals and of course personal goals. For a lot of us that also means setting goals or to do’s for our homes in the form of organization. Just like many of you, I’m starting the year off tackling some of my house goals! 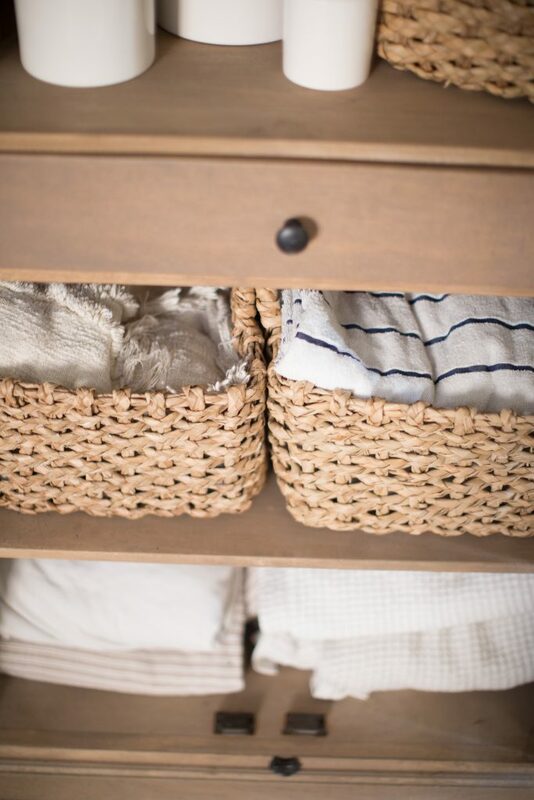 When we moved into our home last year I knew I needed a space for our linens. Because of the way we configured our bathroom we left out a linen closet down stairs. Now remember we do have a fairly large one upstairs. Remember the one I organized last year with all the baskets? But I really wanted something downstairs in our room for easy access to towels , sheets and other bathroom necessities. So I used this cabinet below to hold some of those items and it turned out to be the perfect solution. 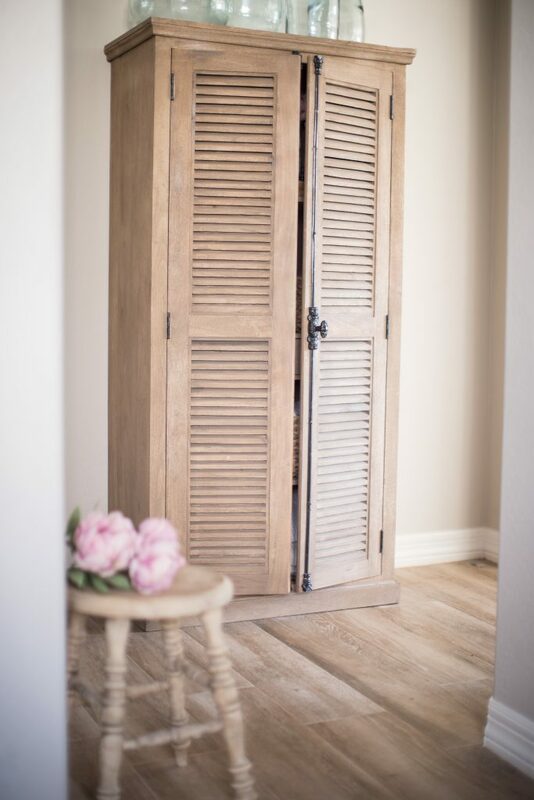 This cabinet is in our master bedroom “mini-hallway” is right off the door and adjacent to the master bathroom. To help with organization needs I purchased a few items from Michaels. Michaels has a ton of storage solutions for you! 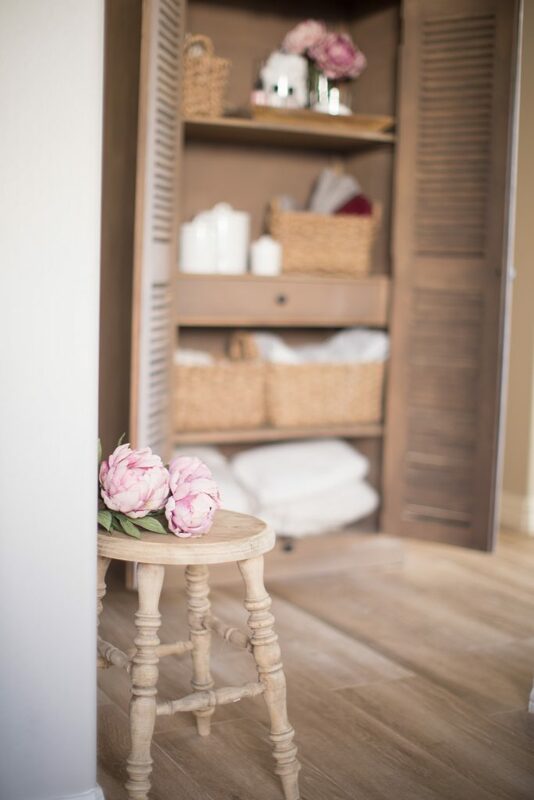 I’m talking bins, baskets, bottles, wood crates, bags, you’ll be so surprised of all the storage solutions they have! Scroll online before your head in the store if you just want to pick something up, or take some time to walk thru the store and explore! First I went to the glass section and spotted these glass cylinders. 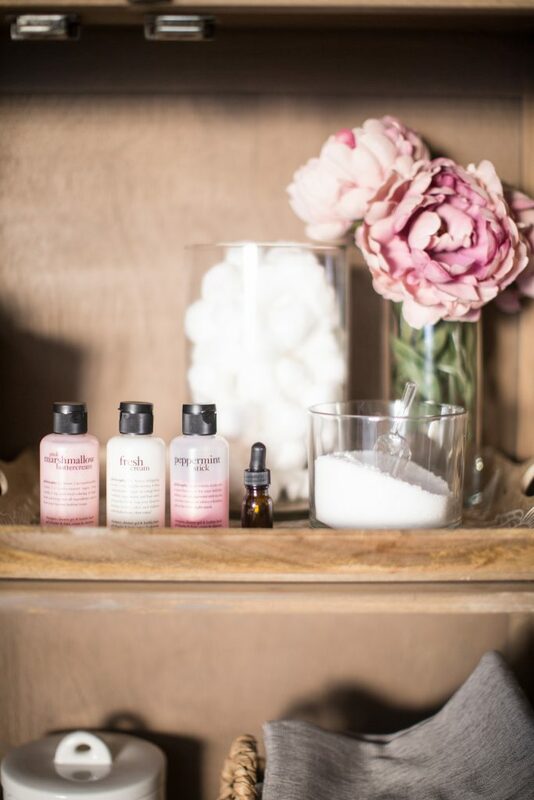 They are great for my bath salts, cotton balls and just a little floral arrangement to make the space pretty. Next to it you’ll see some bubble baths and a dropper full of essential oils. 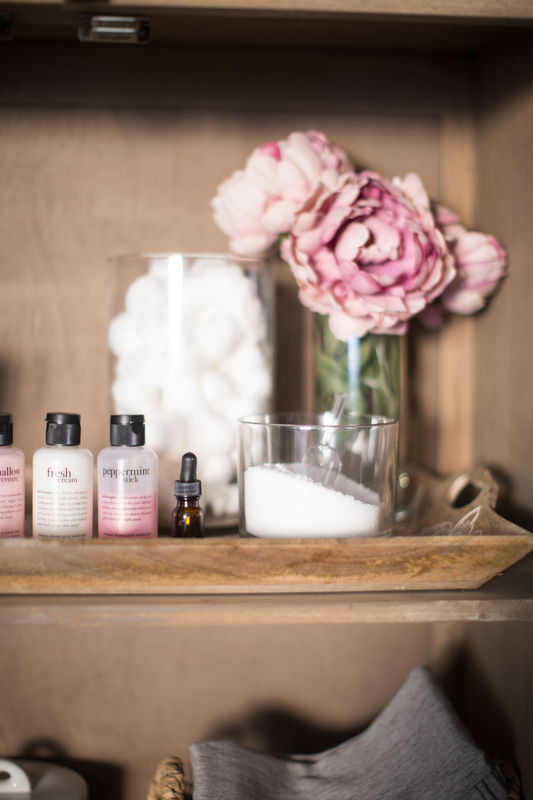 I’m a big believer in bathing so I love to have all my things in close access! 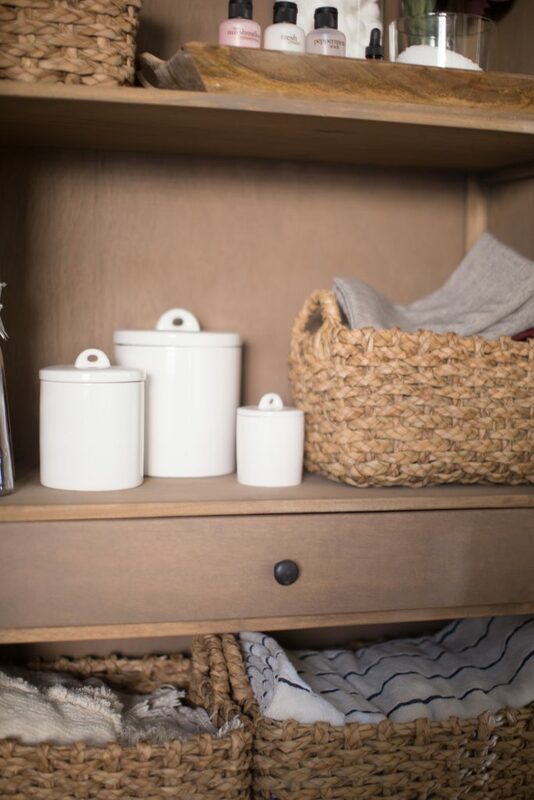 Throughout the cabinet I also have some…you guessed it, baskets. 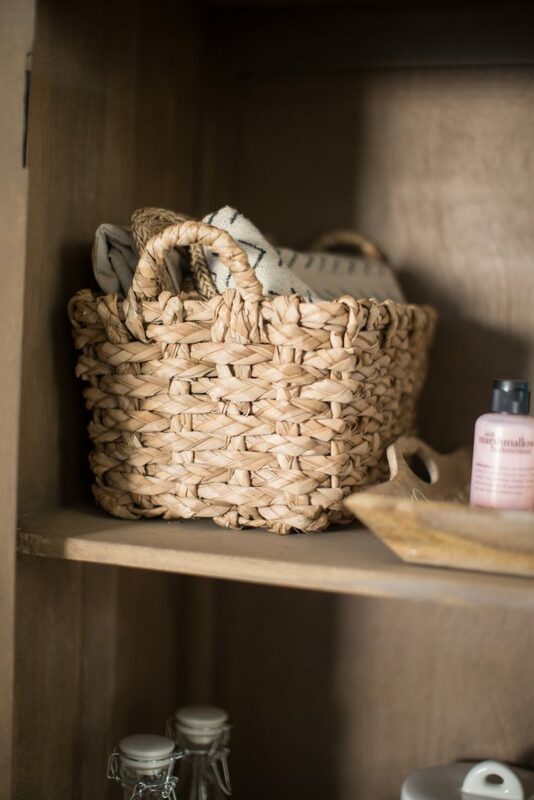 I love baskets for organization because they are so easy and functional. The reason I like these particular baskets is because they are flexible. The fit well in small spaces like this but are strong and sturdy. It keeps items like my pillow covers contained and in order. I just end up storing my actual pillow inserts under the bed. You can find these baskets at your local Michaels because they aren’t available online. Usually canisters like these are for the kitchen but I thought they would be perfect for bath bombs and any other items I purchase for the bathroom. I actually came across these canisters in the Michael’s personalization isle that they have online and in-stores right now! These canisters are ceramic so you can paint on them, add vinyl or even stickers to make it more personal! 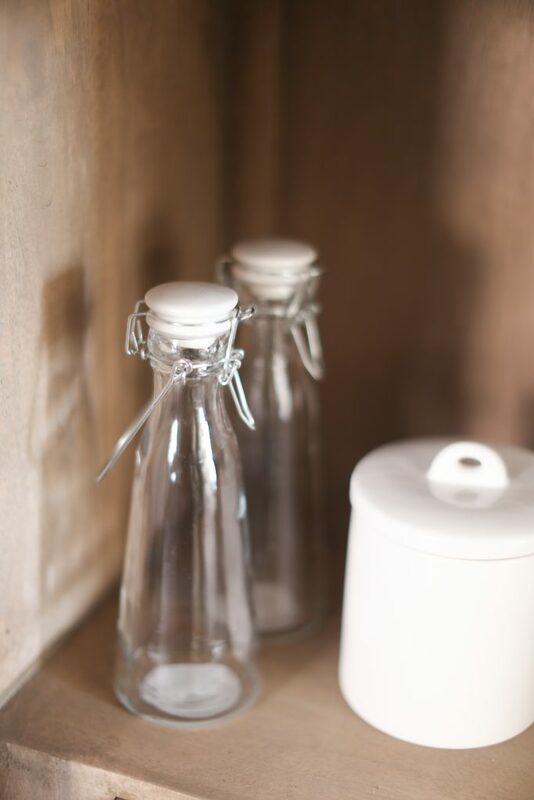 I love to make my own bath salts so I also purchased these bottles with a ceramic lid from the glass section to help with my efforts. Just a few scoops of Epson salt and some drops of essential oils usually does the trick! It’s not big, but it’s the perfect solution for our space. 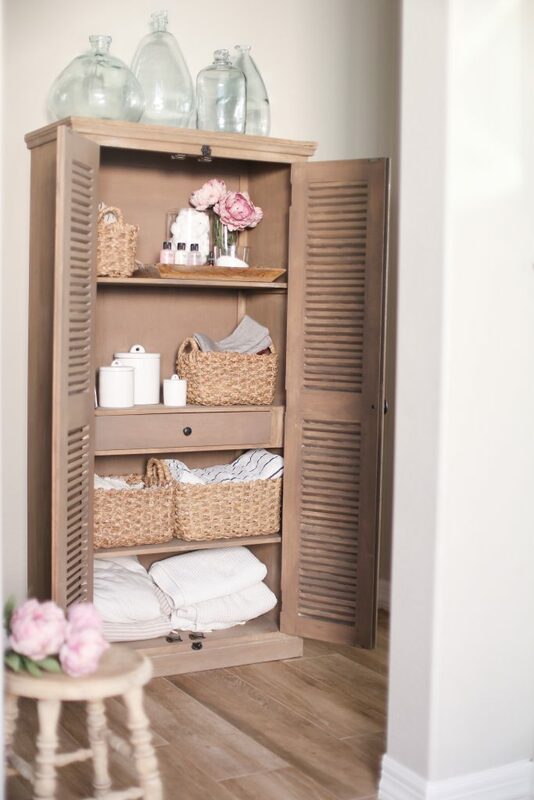 Just a few baskets and other essentials really helped this cabinet become a functional piece for us! What organizational projects are you tackling this year?